A total home makeover started from the ground up, literally, with the homeowners thinking they just wanted to change the flooring. 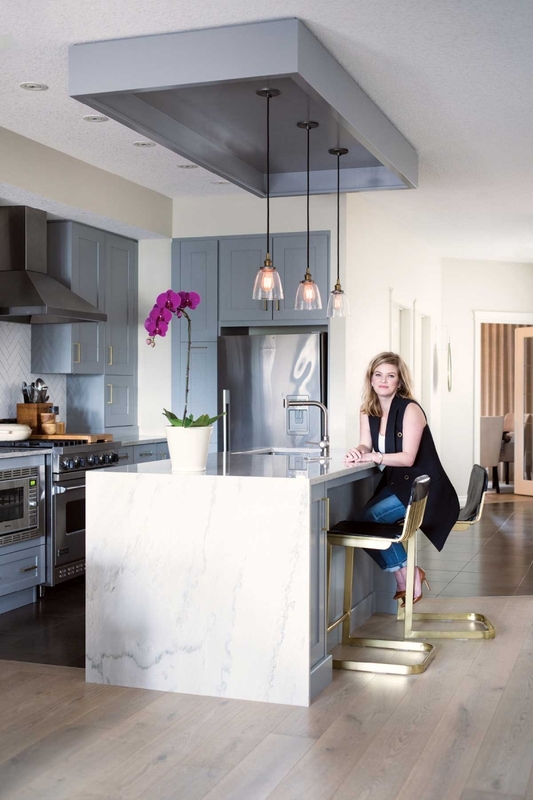 Homeowner Lisa Miller started off wanting to just replace her home’s flooring, but before long, she and husband Keith had the team at Reena Sotropa In House Design Group replace builder-basic options throughout what is now their dream home. Home design by Reena Sotropa In House Design Group. Photograph by Jared Sych. 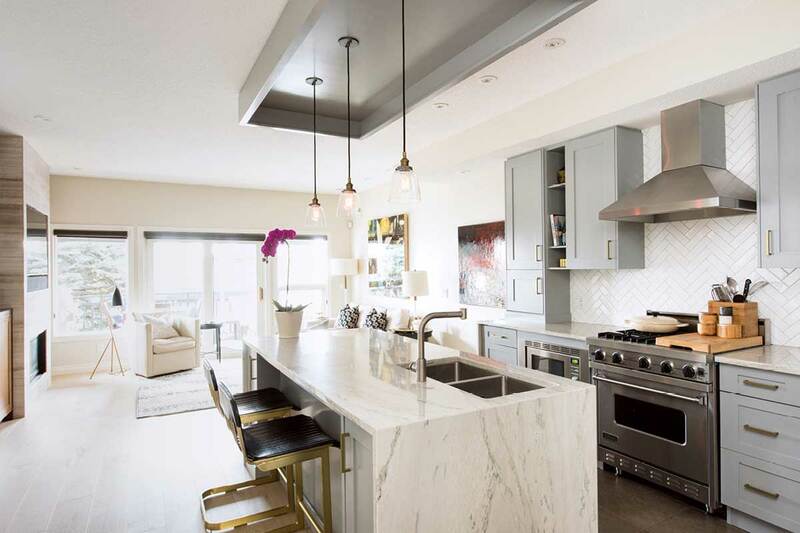 What started as a four-week project to replace flooring morphed into a two-year-plus transformation of Lisa and Keith Miller’s entire two-storey infill in Marda Loop. Everything except some porcelain tiles has been ripped out, replaced or redone. 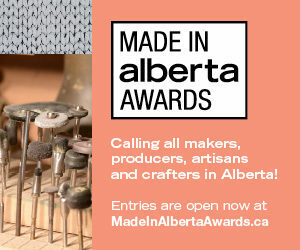 The Millers hired the Reena Sotropa In House Design Group after seeing the company’s work in an issue of Avenue more than 10 years ago. “I remembered that article,” says Lisa. 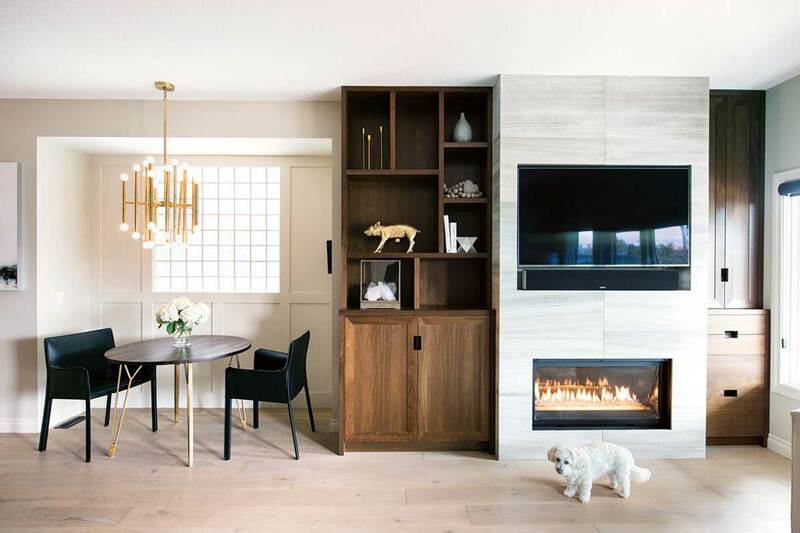 “I just loved their design.” Now, the flooring on all three levels of the 1,800-square-foot home, including the stairs, is a wide-plank, engineered white oak in a smoky, matte finish. Sotropa designed custom, Art-Deco-styled black metal railing to replace the original builder-grade wood spindles. Once the flooring was finished it was obvious to Lisa that more changes were going to have to happen. “Everything had to look good with the floor, ultimately,” she says. “It was very cavey in here,” agrees Lisa. Sotropa’s team used vein-cut limestone to create a stunning floor-to-ceiling focal point that frames the modern fireplace and flat-screen TV. Custom walnut cabinetry flanks the new fireplace and hides all the electronic components. The Millers also had the bathrooms brought up to similar stylish standards. The original bathroom design featured builder-grade granite countertops with banjos — slimmer extensions of the main counters that run along the wall above the toilets (“which I think is so hideous,” says Lisa). Out went the banjos, in came banjo-less black honed-granite countertops. Playful black-and-white Dalmatian-print wallpaper replaced the red-on-red damask wallpaper in the main-floor powder room. The design team also repainted the maple vanity a vibrant electric blue. And just when they thought they were finished with remodelling, Lisa realized she didn’t love the kitchen. So, Sotropa’s design team returned and brightened the compact kitchen by repainting the dark espresso cabinets in soft, warm grey. They replaced the original dark backsplash with white rectangular tiles set in a herringbone pattern. They also replaced the small two-tiered island with a single level waterfall countertop sheathed in a spectacular white Macaubus quartzite. 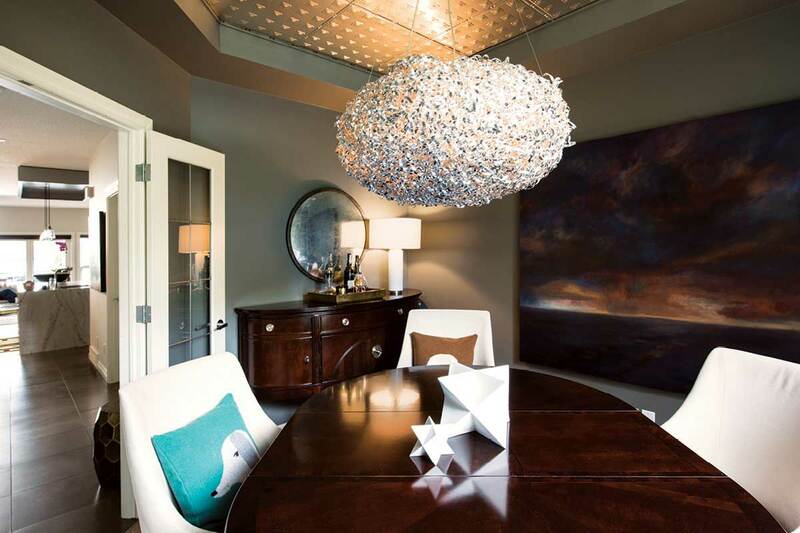 They used matte brass handles in the kitchen and installed a Jonathan Adler chandelier in the same finish in the dining nook to add an elegant sheen to the heart of the home. Although Lisa embraced the lighter and more spacious feel throughout most of the house, she opted to keep one room in the dark. 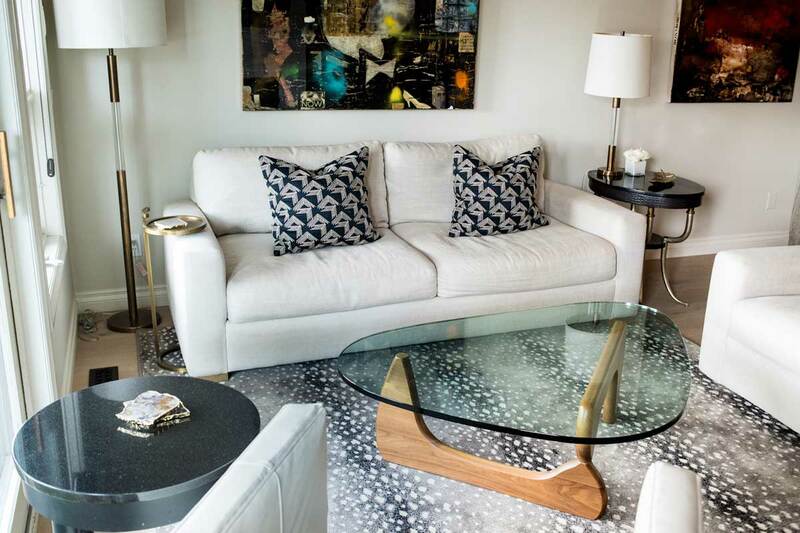 She devoted one upstairs bedroom to what she calls her “den.” A dark, Kelly Wearstler wallpaper printed in metallic-gold organic shapes gives the room a dose of drama. Lisa’s favourite books and keepsakes fill the custom floor-to-ceiling oak bookshelves, and a new Jonathan Adler chair sits beside an elegant bar cart equipped with an espresso machine ready to serve a shot of morning caffeine. Sotropa’s design team replaced the kitchen’s small two-tiered island with a single level waterfall countertop sheathed in a spectacular white Macaubus quartzite. White Macaubas kitchen countertop from Alberta Marble and Tile; Brass bar stools from CB2; Pendant lights over kitchen island from Restoration Hardware; Kitchen cabinet handles from Banbury Lane Design Centre; Kitchen backsplash from Stone Tile. Floor-to-ceiling vein-cut limestone frames the TV and fireplace, creating a dramatic, modern focal point. The dining room’s brass chandelier echoes the cabinet pulls in the nearby kitchen. Breakfast nook table from CB2; Black chairs from Wayfair; Jonathan Adler pendant light in breakfast nook from Carrington Lighting; Fireplace stone from Saltillo Tile; Built-in cabinetry designed by Reena Sotropa, built by Peppertree Studio, 403-701-4231. This living room area sits just off the kitchen. Photograph by Jared Sych. There’s a dining room down the hall from the kitchen. Photograph by Jared Sych. 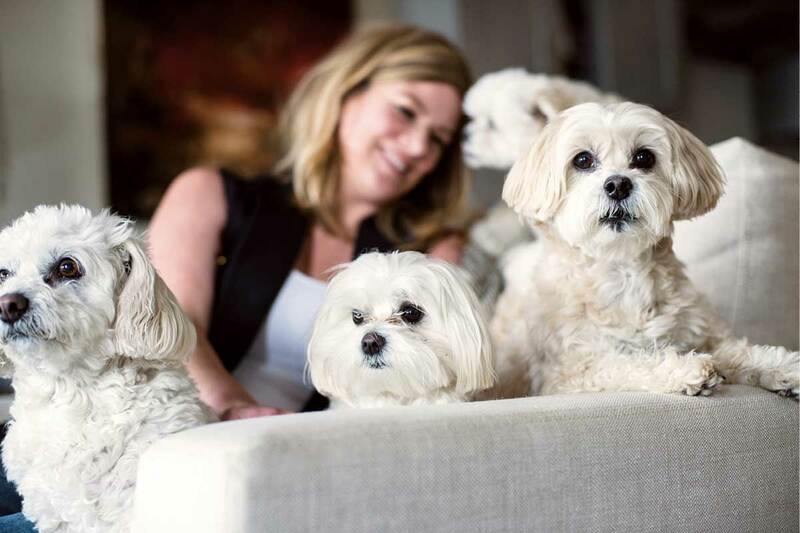 The Millers describe themselves as “homebodies” and love staying in with their four small dogs. Photograph by Jared Sych. 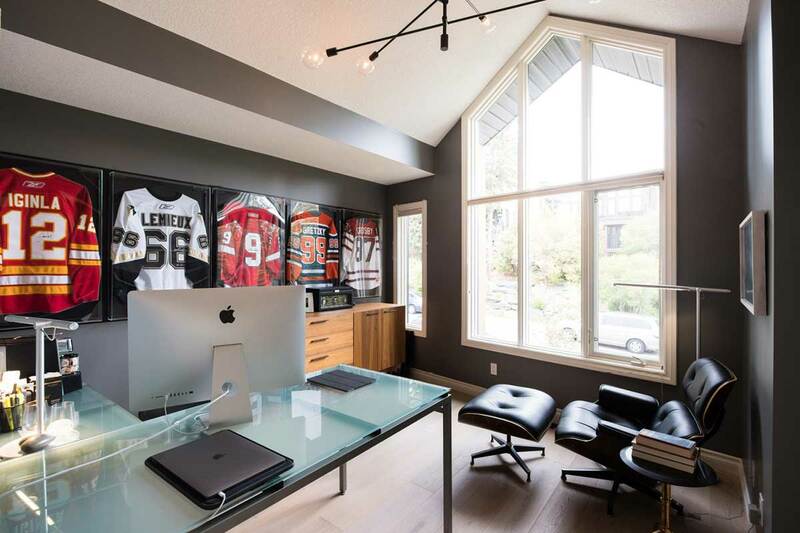 Keith Miller’s office is on the home’s upper level. Photograph by Jared Sych. The dark and dramatic den gets a shot of glamour from the gold wallpaper and a velvet Jonathan Adler chair. 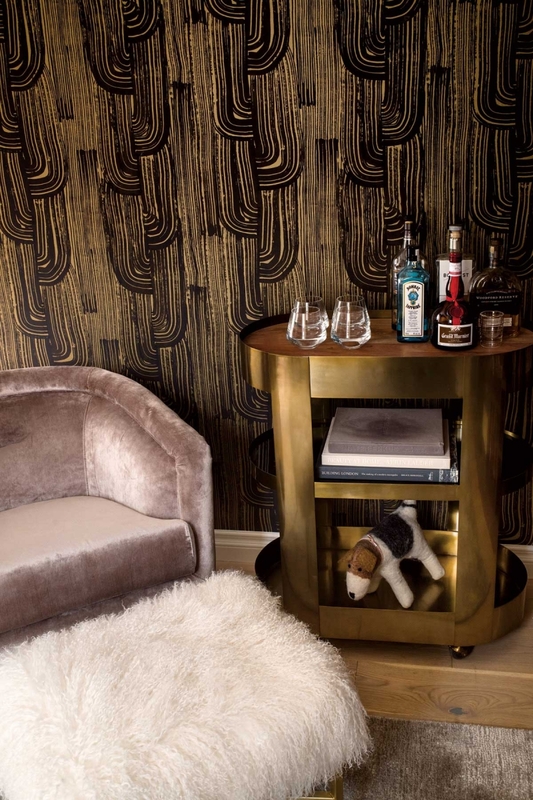 Wallpaper in the study by Kelly Wearstler from DWA Interior Furnishings Inc. (sells to trades only); Pink chair by Jonathan Adler from Dade Loft; Ottoman from Outpost Original; Bar cart from CB2. 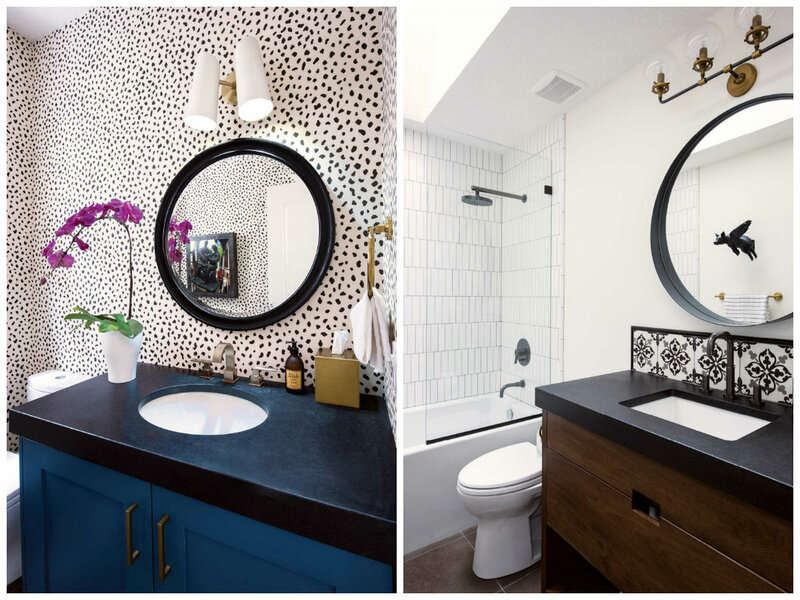 (Left) The design team used bright colour and playful wallpaper to update the powder room. (Right) Honed-granite countertops and contemporary tile updated the second-floor bathroom. Powder room wallpaper by Thibaut from DWA Interior Furnishings Inc.; Bathroom light from Rejuvenation; Aquabrass faucet from The Royal Flush Boutique; Second-floor bathroom vanity designed by Reena Sotropa, built by Peppertree Studio; Vanity tile from Saltillo Tile; Shower tile from Stone Tile; Bathroom light from Restoration Hardware; Piggy from Chintz & Company.